Richard Melville Hall, better known by his stage name Moby, has been a prominent and important artist in the electronica and dance genres for many years now. In 1999, he gave us Play, which, with its 10 million sold copies, became the best-selling electronic album of all time, and also broke records for having every one of its eighteen tracks featured in films, T.V. shows or advertisements. Along with eight other chillingly beautiful albums, and countless collaborations and artistic co-credits, Moby has led a prolific and highly successful musical career. And now, almost two full decades after his first breakthrough, Moby has released his tenth album, Destroyed, a work that is at once unsettling, mysterious, ethereal and—most notably—deeply personal. One of the greatest things about Moby is the way that he lets each song swell and grow into its final shape. And on this admittedly haphazard album, the finest points come when he does just that. Opening track ‘The Broken Places’ seems to speak of lonely, bright lampposts that illuminate bare parking lots in stark black-and-white: Moby makes the delicate electronic beats speak to you in ways that words cannot. ‘Rockets’, too, mesmerises the listener with its vivid imagery of an emptiness that is hardly just the tangible sort. The muffled vocals of ‘Stella Maris’ resonate, like death in a vast cathedral, so beautifully that given the right time of night and frame of mind, they could bring tears to the listener’s eyes out of sheer emotion. ‘The Violent Bear It Away’ is another stand-out track, speaking wordlessly about anxieties that spread out, uncontrollably, from the confines of your head into the details of your everyday life. This is perhaps the track that best captures Moby’s nervous loneliness on the road, which is where he created Destroyed. The highlight of the album, however, comes on the slowly-unfolding, heart-wrenching beauty of ‘Victoria Lucas’. It is on this song that Moby reminds the listener most of his Play-era capabilities. Elegant string sections and gentle, vocalised humming roll sinuously over pumping beats and persistent piano on this track whose name, by the way, is a Plath pseudonym. The problem with Destroyed, though, is its genuine lack of hooks. A single listen through the album will bring to the listener’s notice some truly remarkable moments of bone-chilling and operatic beauty, but another listen will probably be out of the question. In fact, what sticks to you at the end of the album are the irritating parts: the frenetic vocoder on ‘Be the One’, the tedium of ‘Sevastopol’, the oddly-crowded soul ballad ‘The Right Thing’ or the poorly-chosen tempo of ‘Lie Down in Darkness’. Destroyed probably shows us the most honest, vulnerable, and personal side of Moby: true. But it has the tendency to come off less as a grandly autobiographical magnum opus and more as a disheveled, tear-stained, stream-of-consciousness diary. Moby rightfully labeled this album as suitable for late-night drives through the decay of urban emptiness: the ambient, eerie beauty of these 15 songs is perfect for that. The problem, though, is that the album seldom works elsewhere. 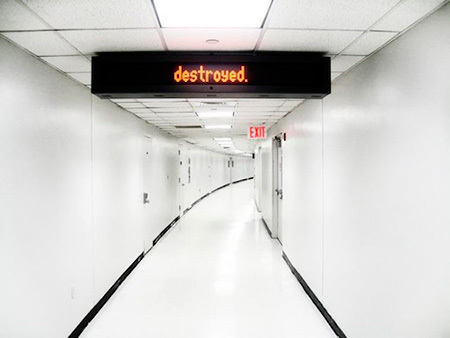 Give Destroyed a spin, but beware: if it’s not during a desolate, empty hour of the night, you’re likely to get annoyed, bored, or both.